Microwaving is a simple, convenient cooking option for people on the go. The microwave oven has been a mainstay in the US for 30+ years, virtually transforming society and how we view food. But despite its wonders, the question that’s been avoided remains: are microwaves the healthiest cooking option? The answer is, of course, no, as there are much better options available that will ensure nutrients will remain in your food. Before we dive into the research on the possible effects and safety of microwave ovens, let’s clarify what a microwave is. A microwave is a form of non-ionizing radiation. As a matter of contrast, ionizing radiation changes the electromagnetic nature of atoms, or ionizes them. This alters the way they interact with other atoms and molecules around them. X-rays, gamma radiation, and nuclear medicine (CT scans, barium swallows, and mammograms) are types of ionizing radiation. Your food is being zapped by high-frequency waves of heat, and some people argue that this radiation can be harmful to your health. One study by Dr. Hans Hertel explored how microwaves change the molecular structure of food and the effects of that food on the human body. In his study, he found that individuals who consumed the microwaved foods experienced a decrease in HDL cholesterol, a reduced red blood cell count, and fewer white blood cells. Unfortunately, no studies have been conducted since to replicate Dr. Hertel’s findings, so it would be reaching to conclude that microwaving does indeed deteriorate health. Still, there are other cooking options that may be far better at retaining the nutritive quality of food. Microwaving cooks the food at very high temperatures in a very short amount of time. This results in a great deal of nutrient loss for most foods, especially vegetables. Our foods are also subjected to nutrient loss when we boil, fry, or roast our food. Boiling vegetables, for example, leeches most of the nutrients (including antioxidants) into the water. The best option for cooking vegetables that will result in only a minor loss of nutrients is steaming. Sautéing and baking at low temperatures is also a viable option that will retain more nutrients than microwaving, boiling, or frying. Of course, by making the majority of your diet raw, with some added dietary fat to help absorb the fat-soluble vitamins (A, D, E, and K), you’ll ensure a high level of nutrient intake. 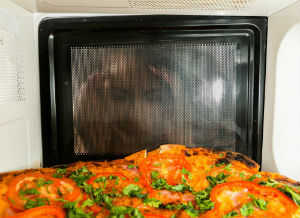 When it comes specifically to microwaves, damage to the food itself isn’t the only concern. Many microwavable foods are processed and in packaging that contains an assortment of chemicals. Chemicals found in many of these containers include benzene, toluene, polyethylene terpthalate (PET), xylene, and dioxins (known carcinogens). At high temperatures, it is likely that chemicals can absorb into the food, and intake of these chemicals presents a high health risk. What’s more, the chemicals in the food themselves are also a cause for concern. What is Bragg's Organic Raw Apple Cider Vinegar? What are the Causes of Nocturia?